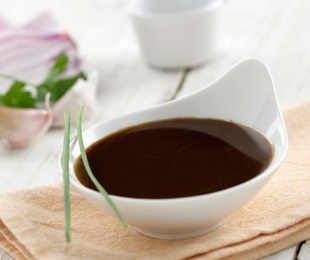 In cooking, Espagnole Sauce (salsa española) is one of Auguste Escoffier's five mother sauces that are the basis of sauce-making in classic French cooking. Spanish cooks use this sauce mainly for meat dishes, for making stuffed peppers, and for vegetable dishes in general. For example, it is an essential element of the old-fashioned patatas a la importancia. In a wide saucepan, heat the olive oil over high heat. Add the onions and cook, stirring constantly, for about 10 minutes, or until golden brown. Add the carrots and flour, mix well, and cook, stirring often, for 10 more minutes. Add the water, sherry and salt, mix well, and cook, stirring occasionally, for about 10 minutes longer, or until the sauce thickens slightly. Remove from the heat and let cool until tepid. Transfer the contents of the pan to a blender or food processor and process until smooth. If not using immediately, cover and store in the refrigerator for up to 1 week. Atun en Rollito a la Asturiana: Whenever I ask Asturians which recipe from their region must be included in a Spanish recipe site like this one, the answer is nearly always the same: Atun en rollito. It is originally from Cudillero, a fishing village close to Aviles, where it is prepared with the bonito that is abundant there during the summer months. The white-fleshed bonito is not easy to find in the United States, but the dish can be made with the pinker-fleshed bluefin tuna instead.